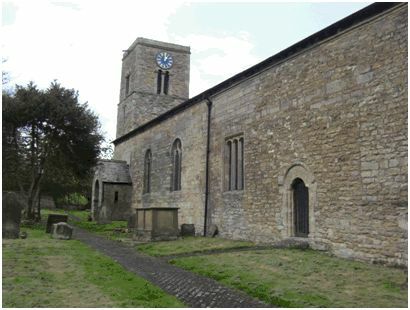 This month features information about the Bassetts of Glentworth, Lincolnshire, England, and updated information about the Bassetts of St. Mary Hill, Glamorgan, Wales. A lot of the information about the St. Mary Hill Bassett line has been done by David Attride. I have included some of his information as well as a trading card for a Bassett from that family. Several people took advantage of the discount offered by Family Tree DNA and ordered kits last month. I will feature results of those kits in future newsletters when the results are available. 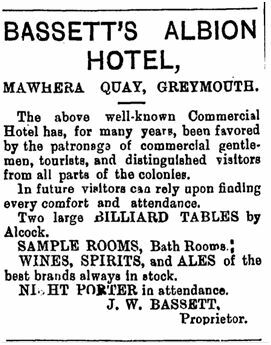 Below are several articles found in New Zealand newspapers about James Walter Bassett. I have not yet identified his ancestors and have no information on his descendants. 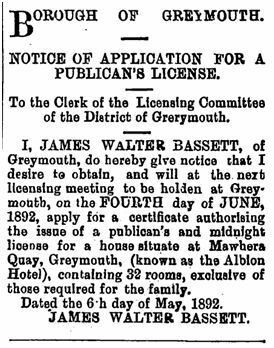 James Walter Bassett, second son of George William Bassett, of Limerick, Ireland, last heard of at West Coast Goldfields, New Zealand, you are requested to communicate with your father immediately, or your uncle John Thomas Verdon, Esq., Barrister at Law, 26 North Summer-street, Dublin. Important news awaits you. DNA results are back for the line of #201B Bassetts of Glentworth, Lincolnshire and are shown below. While there is not a close match at 25 or 37 markers, this line does have an exact match of 12/12 with the Bassetts of Bedfordshire. Based on the DNA results, I believe these Bassetts of Glentworth are related to the Bassetts of Bedfordshire and distantly related to the Bassetts of Staffordshire and Cornwall and share a common ancestor with these other Bassetts 600 - 900 years ago. A history of the first two generations of this family are shown below. William Bassett was born about 1667. He died 10 May 1729, aged 66 years and is buried at Glentworth. He married Lydia Adderley on 28 Oct 1697 in St. Mary’s, All Saints, Chesterfield, Derbyshire. She was born about 1677. She died 13 May 1729, aged 54 years. He is the first Bassett mentioned in the parish records of Glentworth. William became vicar of Glentworth in 1696. He became curate of Harpswell. 201B1. Elizabeth Bassett - born 20 Sep 1698. 201B2. Ralph Bassett - born 14 Oct 1700, buried 17 Nov 1740 in Corringham, Lindsey, Lincoln, England. He was Vicar of Great Corringham in 1724. + 201B3. William Bassett - born 7 Jun 1703, buried 13 Jul 1765 in Glentworth, Lincoln, England, married Elizabeth Whichcot on 19 Feb 1730. 201B4. Lydia Bassett - born 19 Jul 1705, married (1) Robert Capps on 19 Feb 1729, married (2) Robert Athorpe on 27 Sep 1739 in Glentworth, married (3) John Stown on 20 Jun 1747 in Glentworth. 201B5. John Bassett - baptized 30 Sep 1708 in Glentworth, Lincolnshire, England. 201B6. Anne Bassett - born 7 Sep 1710, died 7 Sep 1710. 201B7. Charles Bassett – baptized 24 Jul 1712 in Glentworth. He died in 1763. He married Elizabeth nad had Mary Bassett, born 15 Jan 1748 in Glentworth. She died Jan 1748 in Glenworth. 201B7. Katherine Bassett – baptized 14 Jul 1715 in Glentworth. William Bassett was born 7 Jun 1703. He was buried 13 Jul 1765 in Glentworth, Lincoln, England. He married Elizabeth Whichcot, daughter of George Whichcott of Harpswell, on 19 Feb 1730. She was born in 1706. She was christened 20 Mar 1706 in Harpswell, Lincoln, England. She was buried 19 Feb 1774 in Glentworth, Lincoln, England. He was Archdeacon of Stow. Vicar of Glentworth in 1725. Curate of Toft-by-Newton 1727. 201B31. Frances Bassett - born 22 Feb 1730/1. 201B32. Katherine Bassett - born 14 Jan 1731/2. 201B33. Elizabeth Bassett - born 14 Apr 1734. 201B34. Harriet Bassett - born 4 Nov 1736, died 1737. 201B35. William Bassett - born about 1738. 201B36. 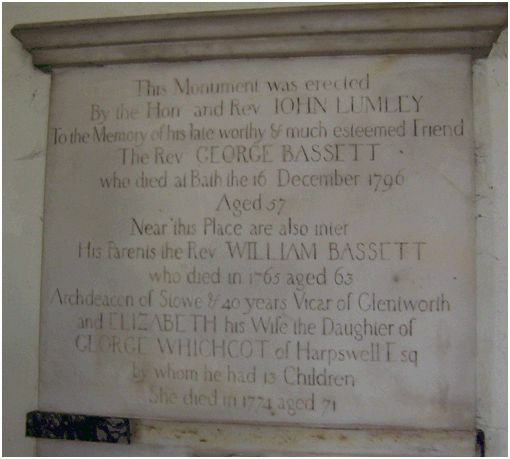 George Bassett - born 27 Sep 1740, died 16 Dec 1796 in Bath, Somerset, England, buried in Glentworth, Lincoln, England. He was Vicar of Glentworth in 1765. Either he or another George Bassett was Vicar of Glentworth in 1793. 201B37. Lydia Bassett - born 17 Feb 1741/2. 201B38. Charlotte Bassett - born 20 Sep 1743. + 201B39. Richard Bassett - born 15 Sep 1744, christened 17 Oct 1744 in Glentworth, Lincoln, England, died 12 Jul 1805, married Martha Armitage on 1 Jul 1774. 201B3A. Thomas Bassett - born 22 Jan 1746/7. + 201B3B. John Bassett - born 22 Feb 1747/8, became vicar of Glentworth in 1788. 201B3C. Charles Bassett - born 21 Jul 1749. New information about the #117B St. Mary Hill Bassett line is presented below. Much of the information used to sort out this family was provided by David Attride, a descendant of Charles Bassett of Cowbridge. More lengthy information found on the stories page dated 7 Jul 2010. Charles Bassett was born about 1702. He died at Llanblethian in April 1786. + 117B1. Thomas Bassett – born before 1742, died about 1786 in England, married Jane Leyson, daughter of Thomas and Elizabeth Leyson. 117B2. Charles Bassett Jr. – died at Cowbridge Oct 1788. 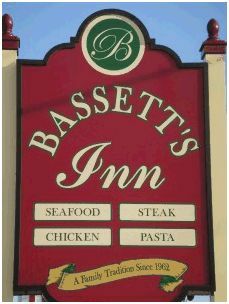 Thomas Bassett, son of Charles Bassett, was born before 1742 He died about 1786 in England. He married Jane Leyson, daughter of Thomas and Elizabeth Leyson, 14 Nov 1758 in Welsh St. Donats. The marriage lists Thomas Bassett of Cowbridge and Jane Leyson of Welsh St Donats. Jane Bassett had a will dated 1817. + 117B11. Charles Bassett – born 5 Jul 1768 in Yastrodowen,Glamorgan, died 12 May 1849 ni St. Mary Hill, Wales, married (1) Catherine Jenkin (2) Anne Walters on 18 Nov 1788 in Ewenny, Glamorgan, Wales. 117B12. Elizabeth Bassett – baptized 1768 in Cowbridge. 117B14. Catherine Bassett – baptized 6 Oct 1772 in Wivelscombe Parish, Somerset, England. + 117B15. Richard Bassett – baptized 30 Dec 1774 in Wivelscombe Parish, Somerset, England married Elizabeth Edmunds in 1796 in St. Mary Hill, Glamorgan, Wales. 117B17. John Bassett – born about 1776 in Llanstephen, Carmarthen, Wales, married Margaret. + 117B18. Robert Bassett – born about 1779 in Llangynog, Carmathen, Wales, married Elizabeth Thomas. Jane Bassett of the parish of Welsh St Donats in the county of Glamorgan, widow. I give unto my three sons Richard Bassett, John Bassett and Robert Bassett one acre of land in the parish of Welsh St Donats to be divided equally being holden of the manor of Talyvan. I give unto my son Charles Bassett of St Mary Hill the sum of 2 pounds; to my daughter Jane Bassett Spinster 10 pounds. I give to Mary the wife of Lewis David of Welsh St Donats 10 pounds and all my household furniture (except one bed which I give to Mary David her mother). I give to Catherine the wife of Morgan John of Welsh St Donats the sum of 5 pounds. I give to Elizabeth the wife of William Williams of Treos in the parish of Langan 2 pounds. Executors: sons: Richard Bassett, John Bassett and Robert Bassett. The Mark of Jane Bassett 25 March 1817. Witnesses: Wm Howell of Cowbridge, Ann Mathew of Ystradowen and Richard Thomas, Prisk. Richard Bassett the lawful son and one of the Executors swears that the personal estate does not amount to more than £10. 2 Aug 1786 Was this 12 months past buried over in England where he was an excise man Thomas Basset, another son of Charles Basset of Cowbridge. 3 of Minute Book PRO 47/304 - Thursday 30th May 1776 – John Popham Officer of Laugham 2d Ride Wales West Colletion having…; Ordered that he be discharged that Thomas Bassett Officer of Weveliscombe Ride, Tiverton Collection succeed him at his own request and that William Treays, dropt assistant at Bristol be Officer of Wiveliscombe Ride or such other ride as he shall be fit for. Issued By The Imperial Tobacco Co.
(Of Great Britain & Ireland), Ltd.
Strong and powerfully-built, Bassett proved himself one of the best Rugby full backs in the British Isles last season. He then captained Wales, who won the International championship for the first time for nine years. Bassett, who is a policeman in the Glamorgan Constabulary, plays for the Penarth club and has eight “caps.” He made a name for himself when he went with the British team to Australia in 1930, for no Rugby player possesses a more devastating tackle. Bassett was elected a member of the Barbarians, the famous touring club. 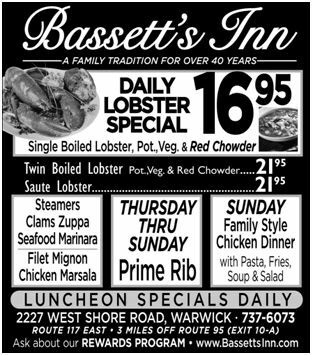 Bassett's Inn, A Family Tradition for over 40 Years. 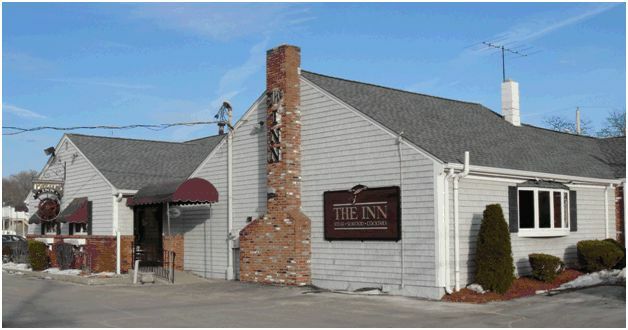 To read more about the Restaurant or see the current menu, click on the link below.